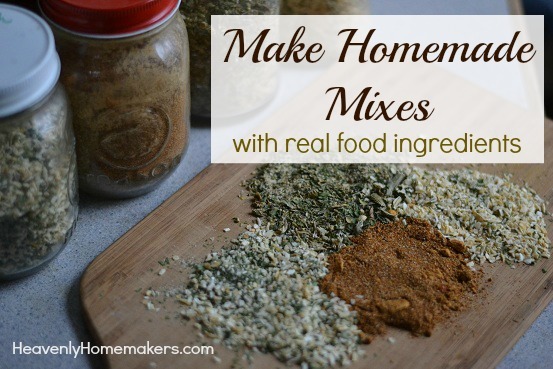 I love making homemade mixes because you can customize them to your taste preferences. Also, you can put them in little jars and give them as gifts. I make a buttermilk ranch seasoning mix and an all purpose seasoning that I often give to others. I’m frequently asked for the recipes. They taste different from commercially available mixes (maybe because they don’t have MSG or fillers like maltodextrin?). Whatever the reason, loved ones seem to really like them (and so do I). It have an italian blend and a meat seasoning blend on hand. We also like to mix together our own honeymustard dressing to have on hand and I create my own baking powder that is much cheaper and aluminum free! Do you have a gluten-free quick baking mix that can be substituted in your baking mix recipes? I don’t know enough about GF baking to know what flours to substitute in my mix. Maybe someone else will chime in on this one! Check out glutenfreeonashoestring.com she has great basic reliable recipes for gf’rs like us, also a good understanding of different mixes out there as well as make your own blends . You can ‘t however just plug gf flours into a regular recipe and expect them to work the same. Gf flours work differently than wheat based ones. I’ve been gf for 20 yrs and her websit and books are easy to understand and good. They are a nice first stop for people looking for a general gf recipe. I just this weekend tried your Ranch Dressing mix and it is fantastic! It’s my new favorite! 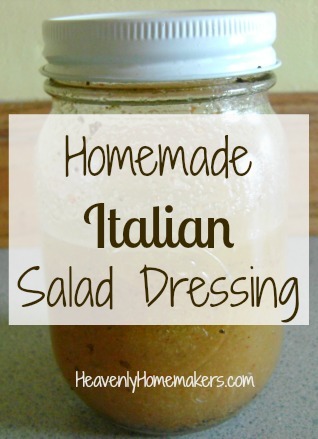 I’ve also made up some of the Italian Dressing mix and plan on making some Italian Pasta Bake this week. I’m enjoying learning how to make my own mixes and use real foods, your book has been a big help as we travel this path. I keep meaning to try making my own cake mixes. Let me know if you stumble upon any good recipes. I have found a good cake mix and pudding mix on brown eyed baker. You can tweak to get rid of granulated sugar and white flour. Great idea! Love the idea of using less processed foods. Looks like I now have a project for the weekend! Thank you! Hi Laura, I was wondering if you have ever tried a Meatloaf Seasoning? My mom made some of the best meatloaf and added a store-bought McCormick’s packet to it… it tastes amazing, but obviously is not very healthy:( Any suggestions or has anyone else done something similar? By the way, I have converted most of my husbands family on the homemade ranch recipe—it is the only Ranch they will eat now:) Thanks so much for sharing! I would check the ingredients of the packet she used on the McCormick website, and start experimenting. If it was the meatloaf mix the ingredients are: Onion, Dextrose, Spices (Including Paprika, Celery Seed, Black Pepper), Sea Salt, Salt, Hydrolyzed Corn Gluten, Soy Protein, And Wheat Gluten, Garlic, Caramel Color, Malted Barley Flour, And Natural Flour. You could get a pretty good start by experimenting with a mix that uses all the recognizable spices, and maybe a little sucanat or other natural sugar to replace the dextrose. I make Laura’s taco seasoning mix and the ranch dressing mix. I made ranch dip using 2 cups sour cream and 2 T. of the ranch mix. Delicious! 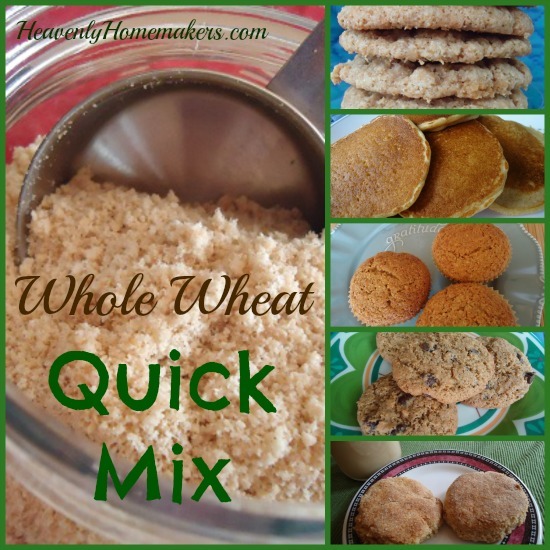 I have made the Whole Wheat Quick Mix (pancakes are wonderful) and also the Basic Muffin Mix from her cookbook. My muffins turn out perfect every time. Definite time savers! Laura, I LOVE your ranch dressing mix and italian dressing mix. I have already made my own pancake mix, but might try your all purpose baking mix! I have made my own brownie mix, but not always loving it. I made my own pudding mix too, it’s ok. But I’m going to check out the above links for my own cake mix recipes!!! I actually have a book called “Make a mix” My favorite is the white sacue mix. It does use powdered milk, so it might not work for your blog but I LOVE it. I use it to make white sauce or gravy! or whatever!